Cassandra's Legacy: Climate Change Mitigation: Is it a Good Idea to Sweep the Carbon Under the Carpet? Above: our paper recently published in Nature Energy. 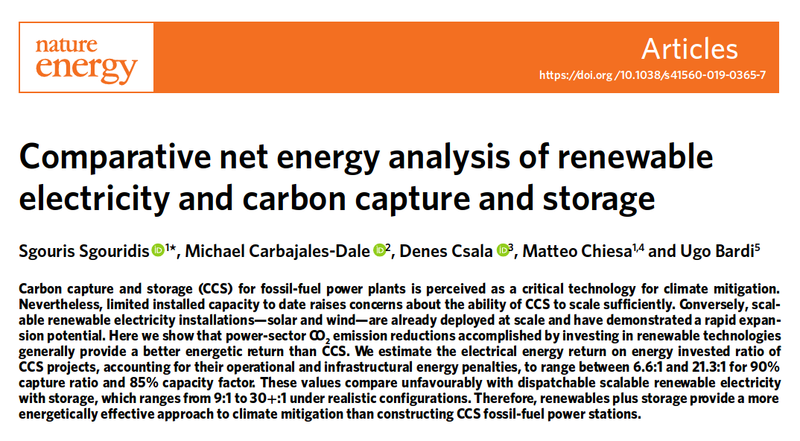 Our conclusion is that, in terms of energy returns, renewable energy in the form of solar or wind is much better than carbon capture and storage for mitigating of climate change. Sweeping the carbon underground is not a good idea. We have a little problem: for more than thirty years, the climate scientists of the International Panel on Climate Change (IPCC) have been telling us that if we don't stop emitting greenhouse gases into the atmosphere -- mainly CO2 -- we are in dire trouble. And we have done very little, nearly nothing. As predicted, we ARE in dire trouble. There is some element showing that things may change: the polls indicate that more and more people are starting to understand the mess we are in and the action of the young Swedish activist Greta Thunberg is making waves in the memesphere. We may be awakening from a 30 years slumber to discover that we have to hurry up and do something. But what? Not that we lack plans: every IPCC report released includes plans on what we could or should do to avoid the worse. We have to follow a steep trajectory of de-carbonization while, at the same time, maintaining a vital minimum supply of energy to society. But how to do that? The most common idea floated in these discussions is to use Carbon Capture and Sequestration (CCS). It is straightforward: instead of releasing into the atmosphere the CO2 emitted by a power plant, you pump it underground, sequestering it in a porous reservoir, maybe one that, earlier on, had contained gas or petroleum. Is that a good idea? Maybe, but it is also a way of sweeping the problem under the carpet. If our problem is the use of fossil fuels, and it is, then by using CCS we are striving to keep alive the technology we should strive to get rid of. But what if CCS were the only possible solution to the problem? Then, yes, if we really had no choice we would have to settle for the least bad idea. But is it true that CCS is the only way forward, or is it a failure of the imagination? Wouldn't renewable energy be a better idea? The way to decide this point is to make a quantitative calculation based on real-world data. CCS doesn't come for free: it is a complex technology with an energy cost. This cost must be factored in comparison with alternatives: it is the concept of energy return for energy invested (EROI). The better the value of the EROI, the better the technology. In the long run, EROI factors trump monetary cost factors: you cannot get energy by printing money. This is exactly what we did, myself and my colleagues Sgouridis, Csala, Dale, and Chiesa, in a paper we published this week on Nature Energy. 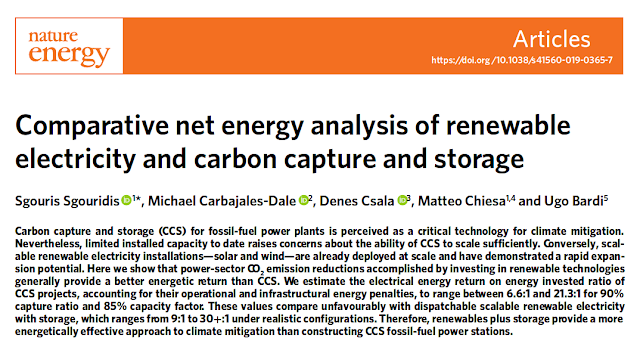 We compared the EROI of CCS and renewable energy using the latest available data and a broad range of assumptions, including the need for energy storage of renewables. The result? Renewables are by now a sufficiently mature technology that for most reasonable assumptions they have a better energy return than fossil-based CCS. You can read our paper at this link. Below you can read some of our conclusions. Here sRE stands for "scalable Renewable Energy", while the "sower's strategy" is the concept that we need to invest some fossil energy in order to build up the renewable infrastructure that will replace the fossil one. You may discuss the details of this result and argue that, in some special conditions, CCS may still have a better EROEI than renewables. But the point is that CCS has additional negative points that renewables don't have. CCS is still a largely untested technology on a large scale but the main problem, as I was mentioning at the beginning, is that by adopting CCS we give new life to the presently agonizing fossil fuel technologies. But fossil fuels are doomed by depletion in any case, so what sense does it make investing the few resouces we still have in a technology that doesn't have a future? In the end, CCS is mainly a failure of the imagination: we can and we should do much better than sweeping the carbon underground. As a final note, our study deals only with CCS as a way to remove carbon from the emissions from the combustion of fossil fuels in power plants. That doesn't mean that we may not need CCS as a way for removing carbon dioxide from the atmosphere. This is called "direct atmospheric capture" (DAC) or "Negative Emission Technologies" (NET). Given the situation, it may be the only way to go back to a CO2 concentration low enough to avoid the worst and it might work! But DAC can work only if it is powered by renewables and it is nice to know that we have the technologies we need. If only we'll ever decide to use them. Link to the paper on Nature Energy. "That doesn't mean that we may not need CCS as a way for removing carbon dioxide from the atmosphere. This is called "direct atmospheric capture" (DAC) or "Negative Emission Technologies" (NET)." Before launching into this great anti-enthropic enterprise (the direct atmospheric CO2 capture), why not first figure out how to extract gold from the seawater? Then with the billions of dollars made from this successful business, you can easily build the "suckers" (CO2 extractors) to quickly reduce the CO2 in the air. Here is the math for those interested: gold is parts per trillion in the water so a cubic meter of water contains milligrams of the stuff. CO2 is parts per million so it's also mgs per cubic meter. The question I have is: will someone pay you more for the CO2 than the gold? Because otherwise you won't make any money. I am still trying to wrap my head around how one of the smartest people around and a member of the Club Of Rome cannot accept the reality of our predicament? Nomadic Beer, it is a funny comment, but you should try to quantify it a little better. You know, in science you don't quantify by analogy. Note: my calculations were off by a thousand. That only makes CO2 capture ~$100 per kg (assuming it makes economic sense to extract gold from seawater). To give you an idea that is 100 times more expensive than oil. And where will the energy come from? So I am still waiting to invest in the new AuroMare company first. Take a look at the papers by Klaus Lackner, for instance. You'll see quantitative calculations of costs and of the energy needed. Of course it is expensive, but not impossible. And if your life is at stake, then you may be willing to pay. So you are saying that CCS is expensive - what does that mean in terms of energy? Looking at the whole system, how much of the energy we need to divert to extract carbon out of the air? Not to mention the other mammoth in the room - the prisoner's dilemma. Who will pay for this and who will continue to burn fossil fuels thus getting the benefits without paying the cost? I suggest to peruse the University of Arizona site. The name of our sad story will be "Icarus falling" (because he was flying too close to the Sun). CCS : for each 2 mountain tops blown up, blowing up a third one to call the electricity produced by the first 2 green, it is just plain atrocious green washing.